Good marketing places a company's goto product in-between a less expensive and a more expensive option. Most consumers will pass over the budget version and focus on the product in the middle. The more expensive version helps the customer establish a price point. In the world of Dremel rotary tools the Dremel 3000 takes the position of the goto product. We reviewed it to help you see through all the marketing hype. Let's take a look, if the Dremel 3000 is a good tool in its own right. 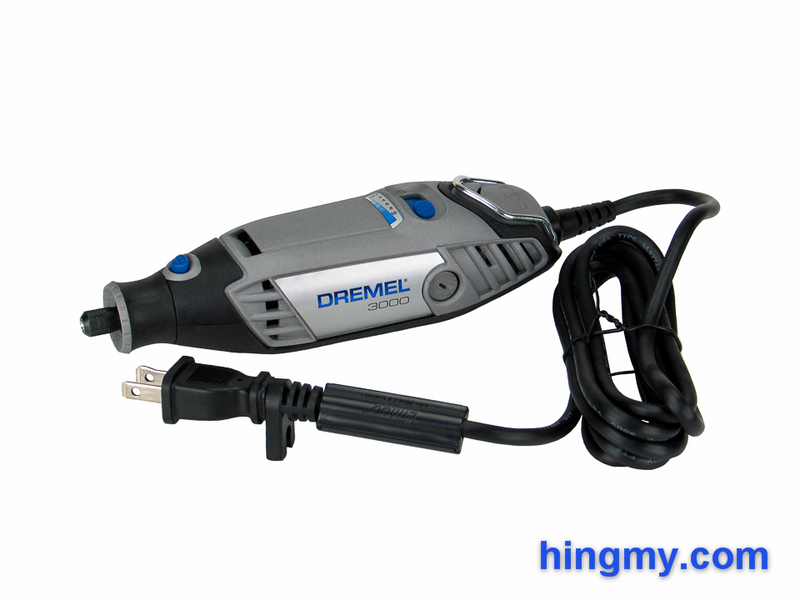 The Dremel 3000 is a handheld rotary tool primarily intended for fine work. It can be used like a pen for detailed work, or like a router for rough work. Sitting in the middle of the Dremel lineup of rotary tools the Dremel 3000's fit&finish is good, but not quite at the professional level. This Dremel 3000 is clearly still a hobbyist tool intended for occasional use. The tool's hard plastic, grey body is covered by a black rubber material on the underside and near the tip. This material both protects the tool and forms the grip. The tool's weight is significant, but still low enough to allowed for pen-style use. The ergonomically formed grip placed most of the weight of the tool in the cradle formed by the thumb and index finger of the hand holding the tool. This leaves most of the user's finger strength free for controlling the tool during a cut. At the rear of the tool is a very useful storage hook. It is intended to allow the tool to be hanged from a wall mounted hook at a crafting station. This is the most convenient way to momentarily store a rotary tool. The hook on the Dremel 3000 is particularly well engineered. It is large and sturdy for an extended life. When not is use the hook folds out of the way. The Dremel 3000 has 10 distinct different speed settings ranging from 32,000 to 5,000 rpm. The tool does not have a gearbox. The motor's speed is reduced electronically. This results in a very pronounced loss of power at lower rpms. At the lowest speed setting the Dremel has almost no power. The spindle can be stopped with very little force. This limits the Dremel 3000 to very fine work at low speeds. The speed selector switch has a soft feel to it. Selecting a speed is fast and accurate, but one cannot help but notice that the switch is easily the worst part of the tool. The selector switch also functions as the tool's On/Off switch. To reach the tool's highest speed the user has to push the switch through all 10 positions. This dynamic makes turning the Dremel 3000 on much harder than it needs to be. Two hands are required. The switch does not protect against accidental activations. The tool comes on when it is plugged in while the switch is set to any of the On positions. This comes in handy when using the Dremel 3000 in combination with a pedal switch, but it can be hazardous in other configurations. The power cord of the Dremel 3000 does not like to lie flat. The twist and turns the cord received from being packed into a storage box are semi-permanent. Because of this keeping the cord out of the way while working can be difficult. The best strategy to combat this issue is to never coil the power cord of your Dremel. One of the strong points of the Dremel lineup is the way attachments are installed. The removable tip of the tool hides threads functioning as the attachment point. The threads create a very strong bond between the tool and the attachment. Installation and removal of any attachment takes only seconds. This mounting system is the same no matter which Dremel you own. 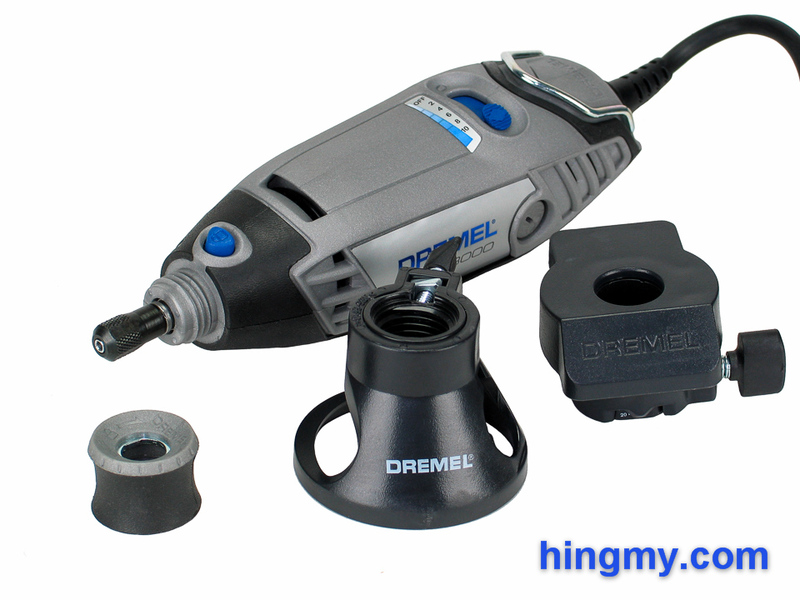 Accessories are shared between tools, which is a compelling argument for choosing a Dremel. Like on all Dremels bit changes take well under a minute to complete. A spindle lock bottom near the tip of the tool locks the spindle in place leaving the other hand free to loosen the collet. Small bits can be installed using your fingers to tighten the collet. When using larger bits the collet must be tightened with a wrench. The stamped metal wrench included in the kit is very poor. It does what it is supposed to, but frequent user will do well by purchasing a better wrench. The spindle lock button is smaller than it needs to be making bit changes unnecessarily uncomfortable. If you are lacking finger strength some bit changes will be unpleasant. The storage box included in the kit is as basic as it gets. While it is made out of thick-walled, vacuum formed plastic, its fit&finish is lacking. The interior barely holds the components of the kit as is. Wrestling the power cord into the box takes more effort than it should. There is no room for any attachments purchased after the fact. The hinges used to lock the box are made from the same plastic the walls are made from. It's only a matter of time until the plastic wears out and the hinges break off. The poor storage box is a compelling argument against buying this particular kit. 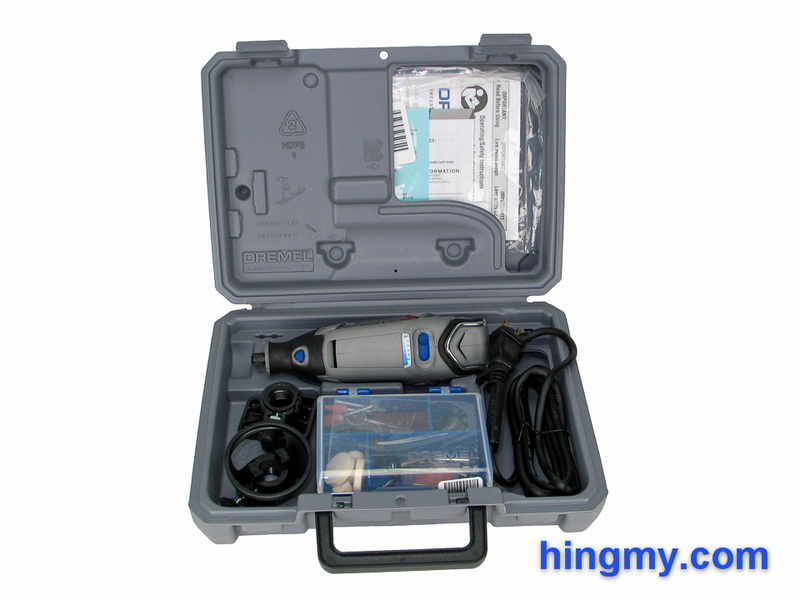 Your best option may be to buy the bare Dremel 3000 tool and shop for a container separately. A tool that has hundreds of different accessories can really benefit from a good compartmentalized storage box. A basic tackle box is a better storage box than the one Dremel included in this kit. At top speed the Dremel 3000 is a very well balanced rotary tool. It produces ample power to drive small and medium bit. Intentionally stalling the motor is very hard. Thanks to the high rotation speed, the stock removal rate is very high. Large bits still pose a challenge at this price level. At times it is necessary to reduce the pressure on the tool and let the bit work a little slower. With patience the Dremel 3000 will see the finish line soon enough. Motor power gradually decreases as motor speed is reduced. At the slowest speed the collet can be stopped with very little pressure. In this configuration the Dremel 3000 can do little more than drive a small engraving bit. If you are looking for a tool to use below ~20,000 rpm, the Dremel 3000 is not it. As well as the Dremel 3000 is built, it is still a hobbyist tool. It can be used for hours on end, but it won't see the end of the week, if you try to use it in a professional or industrial setting. The motor has none of the safeguards and quality required to survive in such an environment. At home on your crafting station in the hands to a caring user the Dremel 3000 will last for many years. Overall the Dremel 3000 is a very useful, yet simple tool. It produces enough power to complete most jobs, but it won't necessarily complete them at a fast pace. 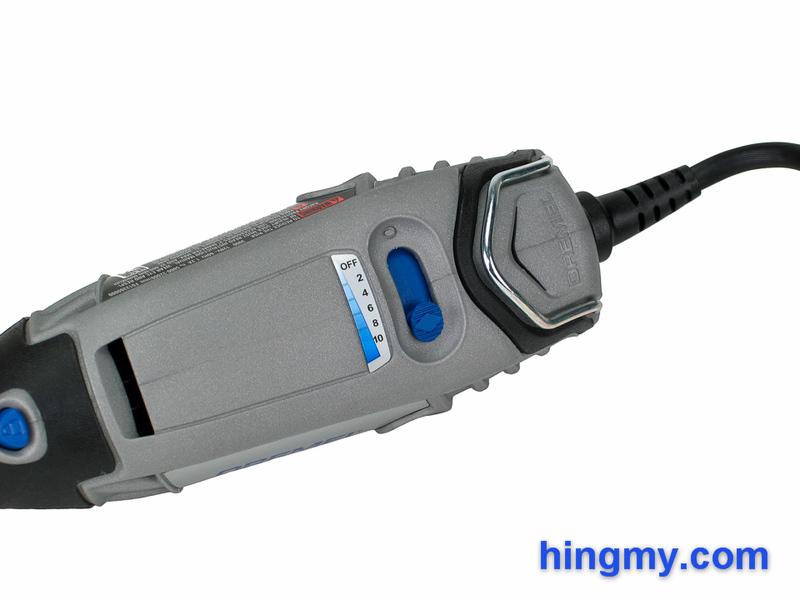 Depending on your hobby the Dremel 3000 might have all the power you need. Engravers should take a note of the lower power output at slow speeds. The Dremel 3000 takes up the middle position in Dremel's lineup of rotary tools. Compared to its brothers the Dremel 3000 has a medium size motor and offers good motor speed controls. The basic Dremel 100 on the lower end of the spectrum is a single speed tool and the weakest of the bunch. The Dremel 4200 at the other end is the most powerful and versatile. The Dremel 3000 is a very capable rotary tool. In many ways it is a great choice for a hobbyist. The motor delivers a good amount of power, which translates into a good stock removal rate when using small to medium size bits. Well built in most areas the Dremel 3000 will last a long time given that you take good care of it and don't use it for large projects. Power output drops off sharply when using anything but the top speed. At its slowest speed the Dremel 3000 is hardly useful. The low quality storage box, poor power cord, and the mixed fit&finish of the tool itself add up to a lackluster overall image. The Dremel 3000 can do a lot of things well, but you'll be wondering if there is a better tool available every time you use it.